For live music in Louisville, you can’t beat the venues, shows, and festivals listed below. GonzoFest – literary and music festival honoring the legacy of Louisville's native son Hunter S. Thompson and Gonzo journalist. Abbey Road on the River - held Memorial Day weekend on the banks of the Ohio River just across the bridge in Jeffersonville, this is the largest Beatles tribute festival in America. Kentucky Reggae Festival – held Memorial Day Weekend at the Louisville Water Tower Park. Forest Fest - enjoy live bluegrass music in the country's largest municipal urban forest. Kentuckiana Pride Festival – a 2-day celebration for the LGBT community and its allies at the Big Four Bridge Lawn with live music and a parade. 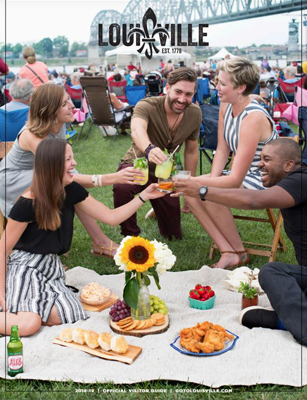 Waterfront Independence Festival – a Fourth of July party featuring concerts, fireworks and food on the banks of the Ohio River. Forecastle Festival - Named one of the top 101 things to do in America by SPIN Magazine, this music, arts and activism festival is held at Waterfront Park. Blues, Brews & BBQ Festival – local BBQ and soul satisying blues at the Louisville Water Tower Park. Kentucky State Fair – a 10-day celebration of Kentucky pride and agriculture featuring daily free and paid concerts from multiple genres and national acts. WorldFest – a celebration of world cultures and their food and musical traditions held at the Belvedere over Labor Day weekend. PeteFest – Three days of music appreciation located on a stunning nature preserve. It’s mission is to spread the love and appreciation for not only music, but culture, art, and community through local artists and businesses. Bourbon and Beyond – an all-in-one bourbon, food, and entertainment destination that honors the rich history of bourbon that is so deeply rooted in Kentucky. Rock the Water Tower – The hottest bands. A Bourbon Tasting Lounge. Mouth-watering barbecue. And an atmosphere worthy of Louisville’s last big party of the summer! National Jug Band Jubilee - a gathering of the nation's best jug bands bringing America's Happiest Music back to its old Kentucky home, in the city that started it all. Louisville Music Awards – a celebration of local music held at Headliners Music Hall. Louder Than Life - the ultimate whiskey, food and rock & roll experience outdoors on the grounds of Champions Park. NuluFest – this street festival is the official after-party of IdeaFestival featuring live bands. Garvin Gate Blues Festival - largest free neighborhood street music festival in Louisville's historic Victorian neighborhood. Non-profit festival & events showcasing bourbon & Kentucky's best. Louisville Mega Cavern’s Lights Under Louisville! Leaders of four major art groups host an annual festival, held in June, with different themes each year.